event and we appreciate that you like our finished quilt enough to purchase our finishing kit and again support my business. Again… THANK YOU! I thought I would share with you how simple it was to do this curved inner border. I am not giving you specific directions in hope that you will have purchased or will now consider purchasing the finishing kit after you see how easy it was done. In the first photo I have stitched the setting triangles and the blocks together into rows, stitched the rows together and then added the borders…as you can see my borders did not have to be this big…but I have never done this before so I didn’t know…The finishing direction will tell you what size to cut your border to…I used a small plate to draw my curves….I have given you the curve in the pattern so no need to audition your plates like I had to do…Trace the curve with your Clover liquid chalk pen. In the third photo I placed the top onto a tan print square, folded the top back and added little dots of Roxanne’s Glue on the edges. Then secured it flat onto the tan fabric. 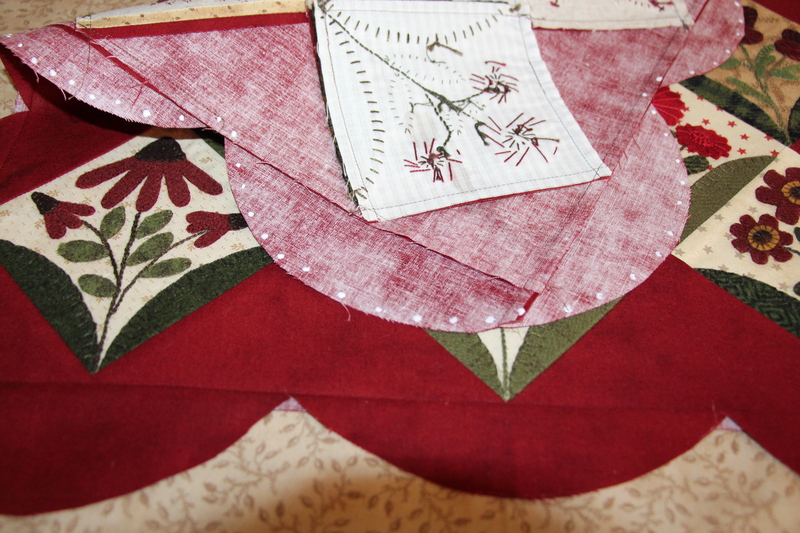 Then the last picture shows the vine placed on the edge of the two fabrics along with some new appliquéd flowers and some from the blocks. If you have changed your mind and now would like to order a finishing kit for your freebie blocks you can do so HERE We will only take orders this week yet to ensure you get a kit. Also this is your last reminder to order a finishing kit for the Words to Live by…quilt. You can purchase that HERE Hope you enjoyed this little peek at how this was stitched. Previous Post and the winners are…. Thanks Lisa! 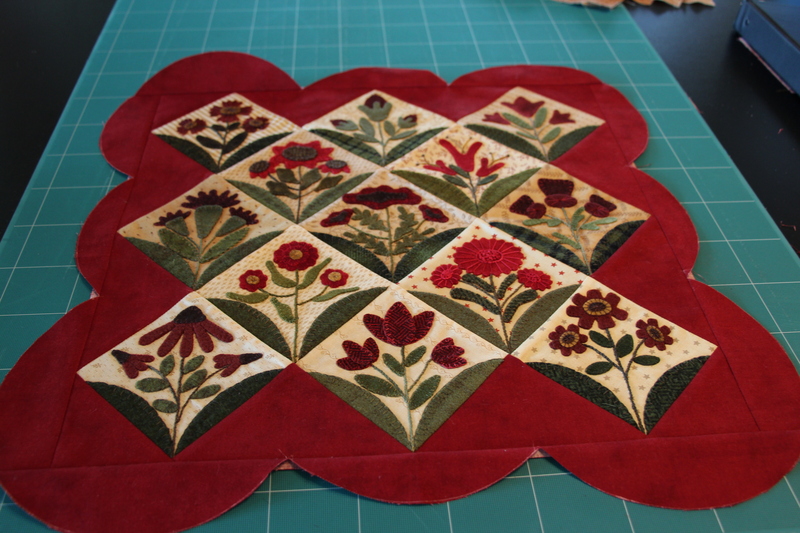 I have finished all my blocks and was getting ready to tackle the finishing kit. This really helps. Hi Lisa, So glad that I already have this finishing kit, it’s a real beauty. Still working on the blocks, but hope to finish by Christmas. My introduction to sewing with wool on fabric has been wonderful. Thanks so much. Beautiful quilt. I hope to some day participate in the free summer blocks. 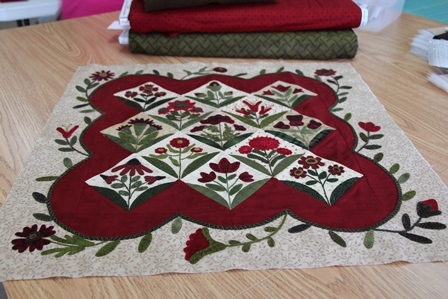 I think this quilt is just stunning with the scallop border and the appliques..
Love it!!! Thanks for sharing your techniques! Fantastic! You are so clever! I can’t wait for my mail now…..
How do i sign up for the summer freebie blocks? They are stunning! Nice finish, Lisa. This is so cute! 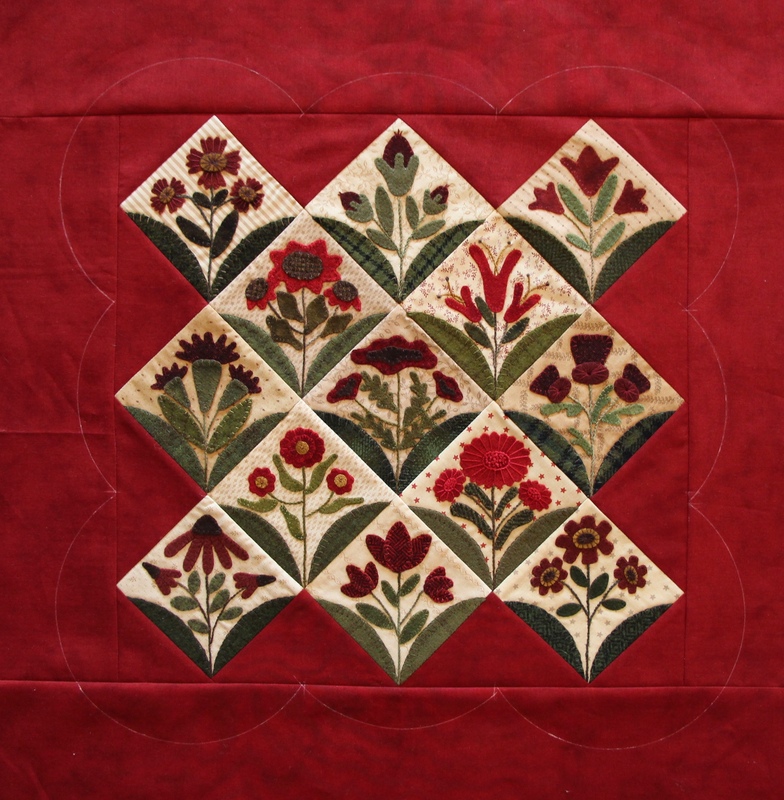 I ordered the whole quilt kit a couple of months ago…will it be shipped soon? I can’t wait to start!! LOVE THIS QUILT!! Thanks again! Thanks for the tutorial on this! It certainly helps to make this technique seem less intimidating. lol! Thanks for the tutorial…..your make it look so easy. I purchased the finishing kit and was reading the instructions and if someone could have animated the moment I got to these steps, there would have been HUGE question marks all around my head. I’m a VERY visual learner and really needed these pictures and details. Again, thank you! you for another great summer project! I ordered the entire kit some time ago. Have you shipped those out yet? I can’t wait! Love the freebie and how you finished it….haven’t got my finishing kit yet, still anxiously waiting…. Thank you for the tutorial on finishing the quilt. I am excited to complete this quilt! How are you coming on this? Thank you! I have not received my summer freebie finishing kit nor my finishing kit for the bow word kits. Please let me know if you need new credit card information as I now have a different card due to someone hacking into my computer. Thank you. Julie Gibson 319-899-7490. Once you press the PS button a menu will probably be displayed. In terms of PS4 availability, the new Sony Play – Station 4 console is currently available around the Amazon website. you possibly can make long distance calls through Skype. She stayed in contact while using Emperor, but continued to rebuff his requests. Great blog design! What’s the name of it? It’s just a matter of locating the right destination to get what you would like. Evey geek needs to keep a cup of coffee handy when they are working or playing. can do serious damage to the system and files. What will the next few years bring for call of duty ghosts cheats xbox 360.
time. Conflict and resolution always makes for a good story.